Owning a property is an attractive investment opportunity but it is just the beginning of your responsibilities. Every owner should be aware of and take their responsibilities as a property owner seriously. 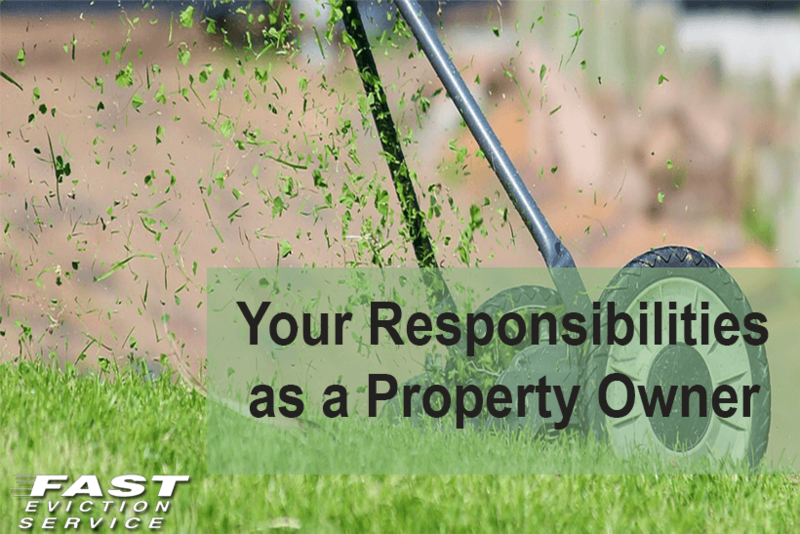 Here is a brief glimpse into the responsibilities of a property owner, which every owner should fulfill. As the owner of a property, you should maintain proper, well-documented records of your property. This will ensure that in case of any kind of dispute you can verify that you are the rightful owner of the property you claim as yours. Owning the property also gives you the right to rent it out to a tenant. Again, if you are renting out your property, you must sign a lease agreement and make sure you keep it safe. It is important to maintain these documents so that later on you can save yourself in case of any conflict, which goes to the court. Property owners are also responsible to adhere to state or local safety and health codes regarding property and rentals. If you fail to comply by these safety rules, you may have to face trouble when you receive a property inspection in the future. These codes vary depending on the state and locality you own a property in. some general examples of safety codes are a requirement to install smoke detectors, remedy of toxic mold in property, lead paint safety regulations and so on. Many cities, which have heavy snowfall, also have a safety code requiring the walkway to be salted and shoveled after certain intervals to avoid accidents and keep the way clear. As a landlord it will be in your interest to maintain the right property insurance. If your property has a mortgage, you may be required to obtain certain kinds of insurance by the lender, such as from fire or flood. Many insurance policies do not cover renting but you have to get the basic insurance for your property. As an owner of a property, you will be responsible to pay property tax to the government. If you rent out your property, there is also tax on rental income, which you are responsible for paying. However, you find that you are liable to many tax deductions as a property owner and you can take advantage of that. These deductions could include interest on mortgage payment. Be sure to find out your rights in this regard before you pay your taxes. As a property owner, you will be responsible to ensure regular maintenance of your property. It is also the responsibility of the property owner to provide a clean and livable premises if they are renting out the property. All switches and other utilities need to be in proper working condition. Weekly maintenance such as sweeping and cleaning rain gutters, garbage disposal are also the responsibilities of the property owner. To keep your property damage free and to prolong the wear and tear, which usually catches up with the property with time, you need to perform any repairs, which may be due in addition to the preventive maintenance. This could include fixing any doors, which may be coming off their hinges, or replacing a broken window. Large repairs such as roof replacement or electrical rewiring are also the responsibility of a property owner, it may not be too soon, but in time these repair become necessary to maintain your property in good shape. It is best that to care for your property you may hire professional services to avoid risk of improper repairs.